Who doesn’t know Saleen? 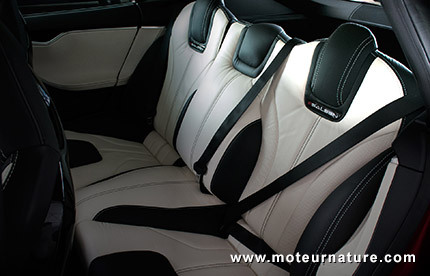 The company was a tuning firm, but it became a real car manufacturer a few years ago, selling brand new cars under its own name, even if those cars were not entirely Saleen-built. Saleen cars are heavily modified Camaros and Mustangs. The company even made a few supercars but it has now moved to something totally new: making a better Tesla Model S. The spec sheet starts with a disappointment though. 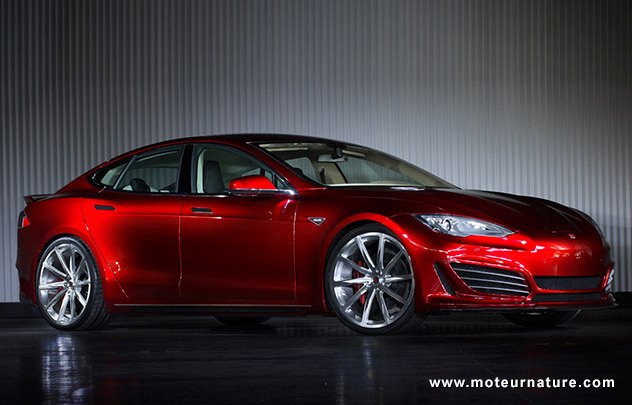 When Saleen Mustangs make much more power than the Ford ones, the Saleen Tesla Model S has the same power and torque as the standard car. 416 hp (hence, the name). Motor and battery don’t change from a Model S 85 kWh Performance. Surprisingly, Saleen says its car accelerates faster, because there’s a trick: a shorter final drive. 11.39 instead of 9.73. That’s numerically very high, but electric motors rev higher than gas engines. 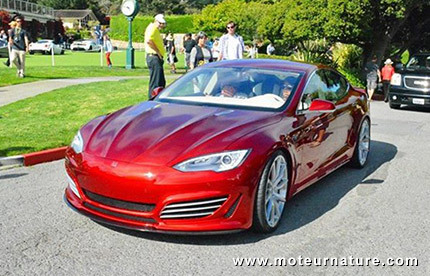 The sad part is that a Model S has a very low top speed, only 130 mph, it will be even lower with shorter gearing. Range may also be reduced, even if larger and taller wheels may compensate a bit. Rear tires are 295/25 ZR 22. A new locking differential helps send the power to the road, and upgrades the suspensions, the braking and, probably the most important, the cooling system. 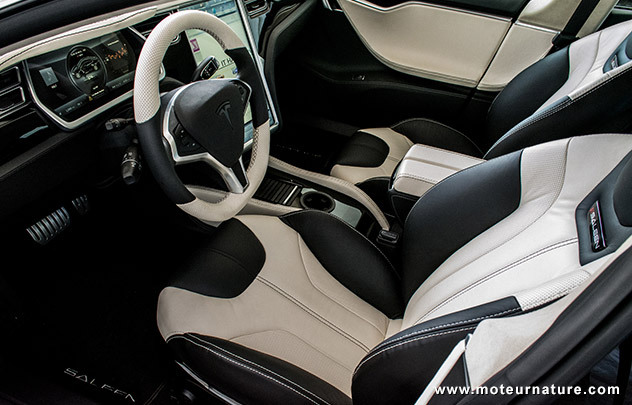 Most people shall remember that a Model S is faster than a BMW M5 in the quarter mile, and some guys then, thought the electric car may match the mighty BMW on the famous Nurburgring race track, but the Tesla is far from being in the same league. It has proved unable so far to race a single lap of the Nurburgring without getting into a reduced power mode. 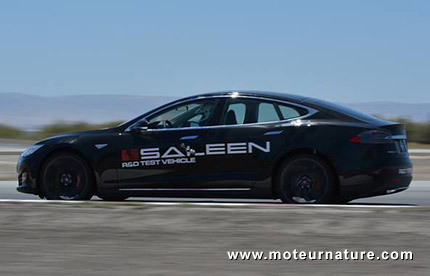 Saleen’s improvement may help a little here. Saleen also added a smart two-tone interior, and a smooth front end, so that anyone can see this is no ordinary Model S, but this doesn’t come cheap. Base price for the Saleen Foursixteen is a stout $152,000. That includes the base Model S, but the mice two-tone interior is a $12,000 extra, and the bigger brakes command an additional $14,000. 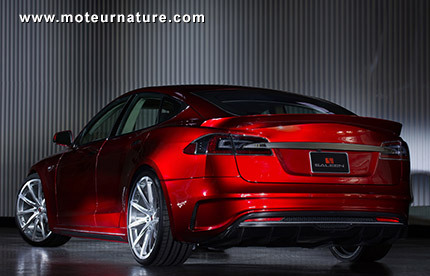 Very serious money, but that’s the price of exclusivity, and suddenly the Tesla Model S doesn’t seem expensive.